Sold as Pair with Sticker. Hard durometer bushings (95a - 97.5a) are for heavier-weight riders (over 125lbs) and allow for a nice tight set-up. Medium durometer bushings (85a - 90a) are for medium-weight riders (75 - 125lbs) & those looking for a looser setup in the RoadSide position when coupled with a harder duro bushing. Soft durometer bushings (75a - 85a) are for light-weight riders & those looking for a loose setup in the RoadSide position. Super-soft durometer bushings (60a - 70a) are designed for very light-weight or young riders and are also fun for those looking for a really loose setup in the RoadSide position. Excellent when used as a Double Barrel combo - but incredibly fun and variable when used in the Roadside position in combo with other shapes & or duro's in the Boardside position. Got these on my 184mm 50 Cals sitting under a 43" Mothman from Fs boards. After a slight adjustment I set the skate tool down and rode. Very fine response, no getting tossed about while carving backwards. I am stoked to have finally tried Riptide. The customer service person answered all my questions in a back and forth message marathon. so very helpful. These and the 96a Pivot Cups is a dream set up. Thank you. I really like and just now came to realize that I prefer RipTide (APS) bushings. (Haven't tested Krank enough yet.) 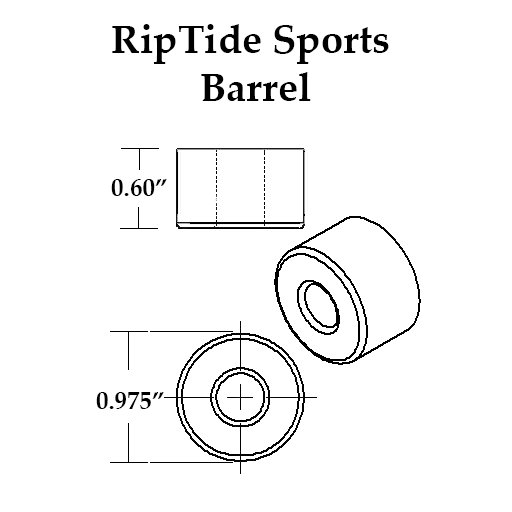 I always thought RipTide bushings are really expensive and not quite as hard as other bushings of the same Durometer (I use the 97.5A and 95A barrels and slightly softer cones in the rear, and much softer stuff up front). I'm an 'old fart' old school skater and I skate these re-issue old school boards with surfey bent pivot TKP trucks. You know, Tracker Trucks, Gullwing Super Pro III (and Mission M1's), Surf-Rodz TKP and Bennett Vector. I've got several sets of each. I *really* love the surfey 'deep snow' feeling of these trucks when carving. Well, now, I have around 10 decks or so, several with identical trucks and different bushing brands and setups, and after about 2 years of experimenting, I suddenly realized there really seems to be noticeably more fun in carving, a lot more of that awesome surfey feeling when carving and a lot more rebound coming out of turns with those decks (with identical trucks) that have RipTide APS bushings (at least 1 barrel in the rear truck and presto, the fun factor goes noticeably up!) than those that have any other brand I've been using (ABEC 11, Venom, Khiro, Grind King, Idependent, stock bushings, etc.). Hence I just placed a big order to get RipTides into all my decks, at least 1 barrel in *every* rear truck! :-))) There is nothing better! Your product is excellent and I love all my new bushings! The combo I've found that works best for my Area K4s for sliding and freeride is a fatcone 95a APS and a barrel 90a APS. Using this bushing roadside on my front Bennett pumping setup with a tall cone boardside for a smooth easy turning experience. Good choice for riders who want to do downhill freeride. They are pretty stable at high speeds but also snappy for going into slides or other tricks. Really enjoyable formula to skate. Highly recommend.